Well, we have been traveling through real Wiley Coyote & Road Runner country! Its is fantastic and beautiful scenery. 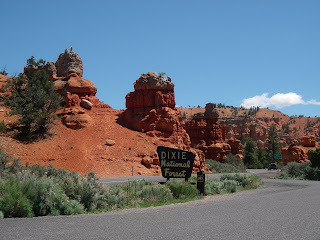 Sunday's ride to Tropic on Hwy 12 took us through Red Canyon. There is every manner of contorted rock formation you can imagine. As a bonus, there was a seven mile bike path through the canyon. 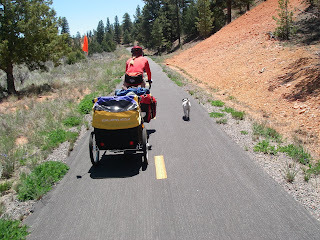 This not only let us ride traffic free, but it meant that Jack could get out of the trailer for a little run. He seemed to really enjoy this. 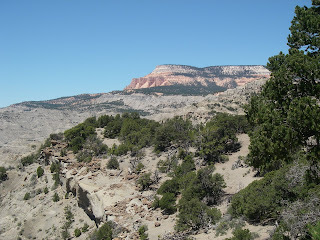 On Monday we passed Powell's Point on the way to Escalante. We couldn't help reflecting on this man's great accomplishments. A one armed explorer, surveyor, and mapper he charted the whole Green River and Colorado River drainages. This is some of the most rugged country in the US. This looks fun! Wild, wild west. Wish I were there.